Everyone loves a good story, and this one deserved to be dusted off and shared again. So uncork something awesome and join an adventurous pair of wine enthusiasts who set off to find their own unique winemaking path in this about San Diego wine story. Unfortunately, I can't read those notes about the secrets of the universe, but what I can do is find some of those seemingly secret 'garagiste' wine-making facilities, once located in a quiet bedroom community in the midst of an unassuming San Diego neighborhood. Fast forward a few years, with much success, and growth, they're now located in Escondido, yet there's no tasting room. But if you'd like to sample their wines, they're available to taste by winemaker led appointment only, please see their website for details. But what I will reveal is the fact that J.Brix is getting most of its fruit from the Santa Barbara Highlands Vineyard and the wine," is going to turn a lot of heads. Just remember you heard it here first. While home wine-making is nothing new, nor is it big "news", however finding a home winemaker putting out amazing juice is a big deal. That said, I'd to shine a big, bright light on J.Brix, a local San Diego winemaker who in my opinion has got his craft dialed in, just like the some of the better known and more established wineries I often visit in traditional settings. I found out about their once 'secret' operation after a fellow wine blogger, and now winemaker made introductions, Beau Carufel of Beau's Barrel Room fame gave me the 'tip' about the quality of wine produced by J.Brix, boy was he right. All the red wines I tasted scored 90 points and higher across the board, with each of their wines set to sell for reasonable prices, making for some very nice QPR. They've got a delicious selection of wines, many from what I like to call the Rhone-Zone, a few variations of Grenache and Syrah and an off-beat Riesling. If you are scratching your head wondering what the bleep is Garagistes or Vins de Garage? Frankly, you're not alone; it's not a term in the common wine enthusiasts vernacular. Similar to ordering Pet-Nat at your favorite upscale restaurant with a hipster Somm. It's just a fancy way of saying you make wine in your garage. It's not a new term, but the onset of this practice is definitely what you'd call quote on quote "nuevo". It's a trend that had really gone viral in the bad old days of 2012 and is still riding a wave of enthusiasm. If you'd like an opportunity to meet and greet other Garagiste winemakers you need to check out the festival in Paso Robles this November. To celebrate the diversity of the many winemaking out-laws and renegades, who are producing some 'serious' vino in their garage or in low-budget shared wine-making facilities, where there are no fancy Chateau's, but boatloads of passion for making seriously 'artisan' (to borrow a dime store word) styles of wine, this years upcoming festival is the place to be. If you want to find out more, make plans to join them, 2018 Paso Garagiste Festival coming up November 9-11, 2018, at Windfall Farms. 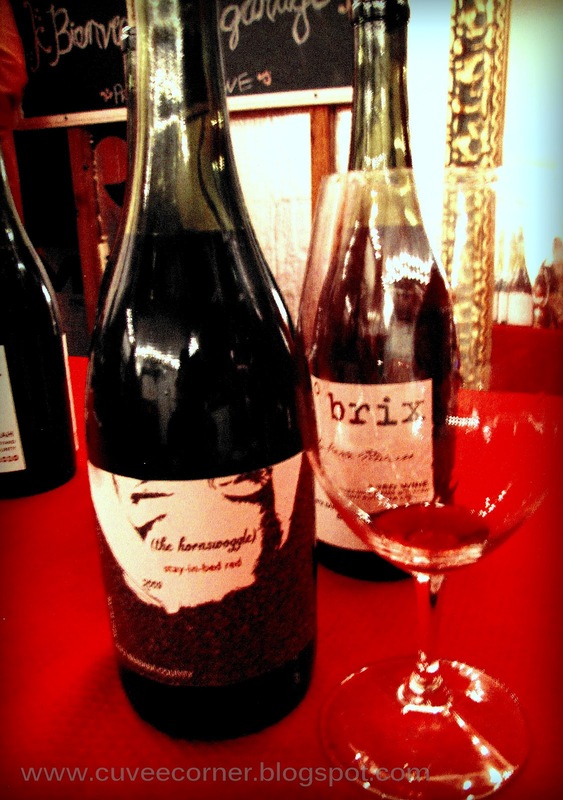 J.Brix is the first successful "garagiste" producer I've run into and one I'd highly recommend that you get to know better. In my opinion, their wines are of such a high quality that they could command some serious price points in the future; based on what I tasted, to borrow a line from a song, I'd say their future is so bright they gotta wear shades! Their wines are as good as many of my favorite Central Coast producers, I'd invite you to seriously consider getting to know both Emily and Jody Brix Towe, great folks, whose passion for winemaking is evident from the first splash to the last drop. Wow, so, talk about boutique-producers, they've got that going on in spades, and with only producing smallish case counts of each wine produced you'll need to act quickly if you'd like to score some Vin de garage. But with quality like this, those case counts could be gone in a flash. Below, I reviewed a couple of excellent examples I tasted just last weekend. Below are the wines I reviewed back in 2012, I'm sure these bottles are long gone by now. But make an appointment to taste what they've got going on now. Good news, it looks like growth and success has not changed their pricing much at all, it's pretty similar to those posted back then. 2011 Uncontainable Vin Gris of Grenache: Not only is it not-containable, but it's also quite refreshing and just plain fun to drink. A nose of dried rose petals, but wow, this wine has a gorgeous body to it, I'd say more like that of a tiny-dancer. On the palate, it’s light and lean, graceful, and definitely, a nice bit of substance, a plush mouth-feel sharing generous flavors and aromas, think cranberries and fresh summer strawberries and a splash of citrus, hello summertime pool-side companion. It has me thinking, roasted chicken and freshly grilled veggies, I scored this wine 89 points, very nicely done. 2009 Grenache La Paloma Libresca: Very generous fruit is up front and has a nice follow-through on the finish. While chock full rich spiced red fruit and boysenberry, dark cherry with smooth, warmly textured tannins, which you won't find too heavy-handed. A fun but none-the-less subtle exotic spice note quietly plays bass in the background, very compelling. This wine says; backyard barbecue favorite all the way, grab some free-range chicken, your favorite marinade or BBQ sauce, it's time for a party. I gave this wine a score of 91 points, again wow, nicely done. 2009 La Belle Rêveuse Grenache, Syrah Blend: It's a wine based on very fresh fruit; it is intense and full of energy, something like; 60% Syrah and Grenache 40%. A wine impressively endowed with nice girth and weight to it. Ripe red and black fruits give it a generous mouthfeel, the barbecue spices, and underbrush tie the whole package together. Wonderfully textured, it’s rich and very impressive from the first splash to the last drop. Another remarkable effort, 92 points, wow! Until next time folks here's to a wine-tastic week; remember as always life is short, so don't settle for commodity wines and sip long and prosper cheers! Glad you got out there to taste the wines Bill, I think that the J. Brix story is one that needs to be told, and they're among the vanguard of new, exciting San Diego-area vintners and wineries doing great things.